This is our standard 3 bay, post and beam room in the roof garage, which is simply formed by adding an extra extension kit to our double garage and then fitting room-in-the-roof trusses on top. They are available with 3 different roofing styles: Barn-end, Hipped and Gabled-end. We are able to supply any size of room over garage to order. Each Beamlock bay is calculated to comply with structural building regs and can therefore go on ad infinitum without a problem. We have listed our standard prices below but we are also able to price these buildings on application as there are too many variables to set out in a simple pricing table. Please contact us for details. What roofing material can Beamlock take? We get asked frequently which roofing materials are suitable for use with Beamlock carports, as most clients like to match roofing with their house or surrounding buildings. The answer is that Beamlock has been engineered to accept nearly all types including heavy clay and pan tiles. What Roofing Materials do we offer? 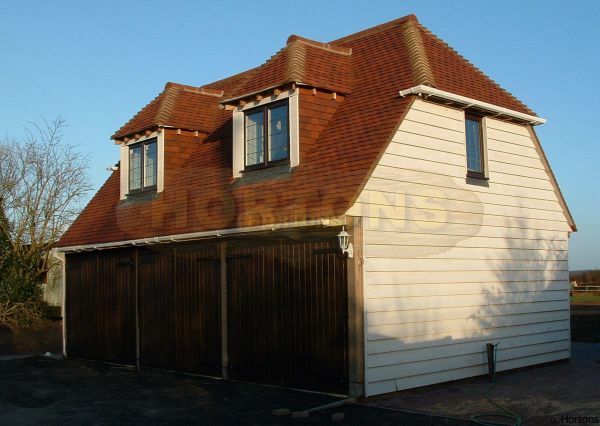 We currently offer cedar shingles (see image). However, If you have special requirements, please let us know. If you want to supply your own roofing material we would simply supply the roof carcass, leaving it ready for you to tile, felt and batten with a roofing material of your choice. Example prices for 2 storey beamlock garage kits are listed below. Please note that these prices are subject to delivery charges and items such as doors, windows and staircases may still need to be factored in, all of which can affect the price. Basework is not included in the pricing.